As part of the Medicis-Promed* project, Lemer Pax designed and produced a new type B container, a first for the company! Its objective: transport exotic isotopes from their place of production to hospitals or radiopharmacies. This year, the Colibri (COLIs type B for Radioisotopes) will enter its final certification phase! Overview on this European collaborative project. Created in 2015, the Medicis-Promed (“MEDICIS-produced radioisotope beams for medicine”) project is an innovating training network. This truly European network is part of the European Union framework programme dedicated to research and innovation: 2020 horizon. 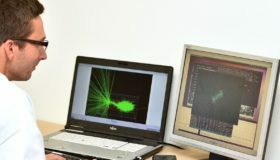 The aim of the Medicis-Promed project, managed by the CERN (European Council for Nuclear Research) is to train a new generation of 15 entrepreneur scientists in the fields of the production and use of innovating radioisotopes. Medicis-Promed therefore associates the university, industrial and hospital domains with research institutes to solve issues related to the production, transport, manufacture and injection in patients of new radiolabeled compounds for vector imaging and cancer therapy. Lemer Pax contributed to this project by providing all its expertise in the transport of radioactive materials. 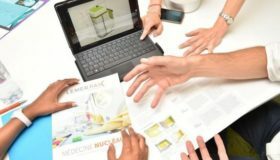 The company supervised an Italian physics PhD student – Maddalena Maietta – with the design of a new type B container intended for the transport of large activities of raw materials for pharmaceutical use. Maddalena conducted the radiation protection study for numerous isotopes amongst those most widely used in nuclear medicine (Y-90, Sm-153, At-211, Ac-225, Lu-177, Ra-226, W-188). She also calculated the mechanical strength, using numerical simulations, and conducted the thermal study, guaranteeing the fire resistance of the container. The company’s first Type B transport container, the Colibri provides optimised radiation protection for the transport and storage of radioactive sources. 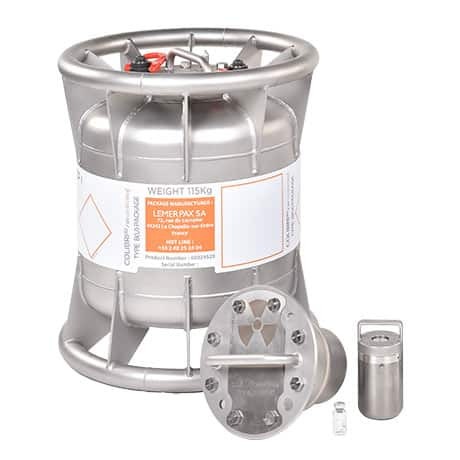 This container was therefore designed to protect operators and the environment against contamination and exposure to alpha, beta, gamma and neutron radiation. For greater safety during its transport, the Colibri-30 type B container consists of two parts: a lockable overpackaging, made of stainless steel 304 L (inside and outside), and an inner Posisafe® KL-30 container, weighing 16 kg, equipped with a secure magnetic opening offering optimum attenuation through the use of tungsten walls. When designing this new container, Lemer Pax worked in partnership with prestigious local scientists. 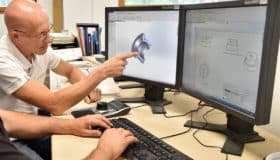 The laboratories Subatech and Arronax together with Nantes University therefore helped to optimise the resistance tests by performing mechanical simulations. Objectives: test the accident conditions and anticipate the deformations generated. The results of these simulations are intended to identify the weak points, right from the design phase. To ensure the validity of these simulations, a prototype composed of a cylindrical body, an inner mass and a curved bottom, was subjected to a 9 m free fall test. Result: the deformation observed on the real case corresponds perfectly to the deformation created by the 3D numerical simulation. The methodology used to simulate the accident conditions therefore provides valuable information to ensure suitable reinforcement of the structure. For a sophisticated design subjected to harsh accident conditions, as defined by the IAEA on the transport of large quantities of radioactive material, simulation helped keep down the development costs by avoiding the need to manufacture numerous prototypes. This is the most drastic scientific validation ever conducted on a container designed by Lemer Pax. 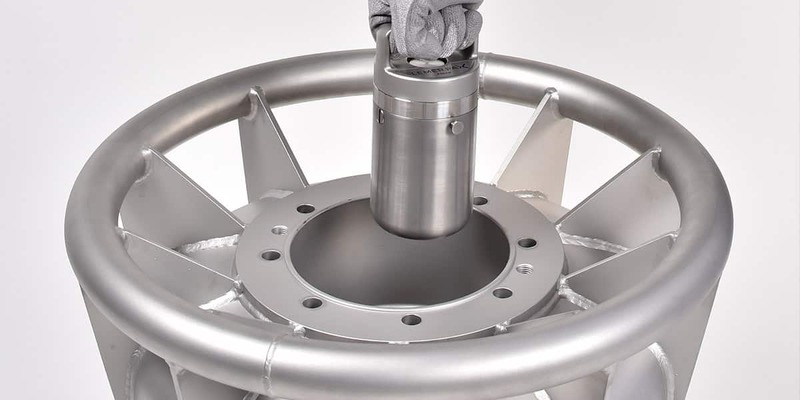 The company will therefore closely monitor validation of the certification tests by the French Nuclear Safety Authority (ASN) and the French Institute for Radiation Protection and Nuclear Safety (IRSN) scheduled for this year.